I love them all,and I hope you are feeling better. My back is better some days than others, thanks for your well wishes. Sorry, I should have not sent you an imaginary $ Bag, must have been too heavy. How was you Birthday? Were you in fine form to celebrate? Did you DH, make you dinner? Thanks for asking, my birthday was great! I was so happy to have passed the DMV vision test, that was really all I wanted! Actually, I forget what we had for dinner, but I remember the humongous chocolate birthday cake my husband gave me! The cake sounds so yummy. I am so happy for you that you passed the Test. I have a can of cocoa and I am going to make a chocolate cake. Have you ever browse The Artist Market 2112 (book)? It comes out every year, 2010, 2011, etc. is another past year, it is still good. If you are interested, here is the book and also a few other books, including a Children's market, further down on the link. That is what I remember. I was not organized when I read it, (now, I am) I may pick it up, once again. 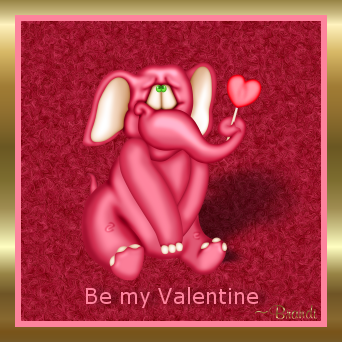 Not too late to request a Valentine avatar design! Just leave me a post. I love it,and save them all. Good to hear from you jamms! I know exactly what you mean about the Caylee case. I have not been very active here lately either, although I read every day. As to your avatar request, I am not sure what you are looking for specifically, so I came up with 3 faces, hoping one is the one you like. 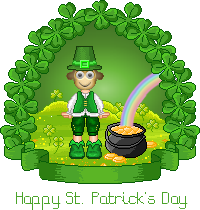 Since tomorrow is Valentine's Day and you'd be changing avatars tomorrow night, I made these as St. Patrick's Day avatars. I could also make you an everyday avatar if I know which face you like the best. Another lady, in case you like her better. Do you by any chance have anything special for Isabella for St. Patrick's day? When you get a chance, it would be wonderful to see her in a new outfit for the holiday! I'll see what I can conjure up for you and post it later tonight. 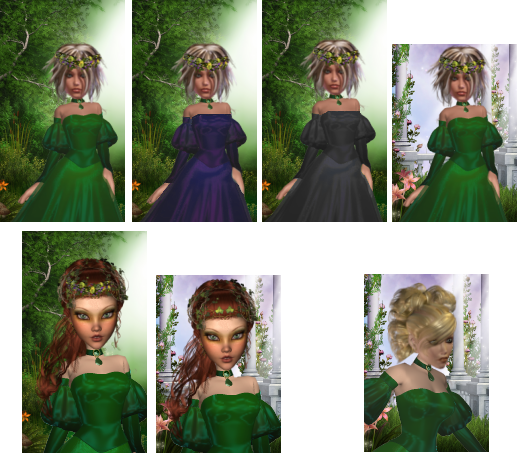 It's time for St. Patrick's Day avatars! If you want to use yours from last year, last year's designs can be found here. And the year before are here. If you'd like a new design, just leave a post! And may the luck o' the Irish be with you! Next month, we will have flowers, something nice to look forward to. Have you thought about investing in a new mattress, could that be why you have a achey back? Here's Isabella in a dress she has worn before, but in a different colour. And a totally different look for her! I LOVE these. Thank you soooo much! You're an angel. Hey, Brandi! Any chance of you making my monkey Mardi Gras friendly? We're going to Louisiana for Mardi Gras Friday. (Not New Orleans, I'm too old and cranky to deal with the crowds...We're heading for the little towns that celebrate.) It would be great if you could...Thanks so much! I'll work on your request today and post something tonight for you! How cool you get to go and celebrate! Made yours ahead of time, anticipating your request! I must say, you look lovely in green! Page created in 10.115 seconds with 19 queries.